Raghuram (Naga Babu) is a honest reporter who prepares a under cover report on mafia don Nana Bhai. The report falls in wrong hands and reaches Nana. As a result Nana kills Raghuram and his family. Raghuram’s son Rajaram (Venkatesh) survives and when he becomes big he tries for revenge. How he would destroys Nana and his men forms the rest of the story. Venkatesh palyed the role of an action hero after a long time and he managed it well. 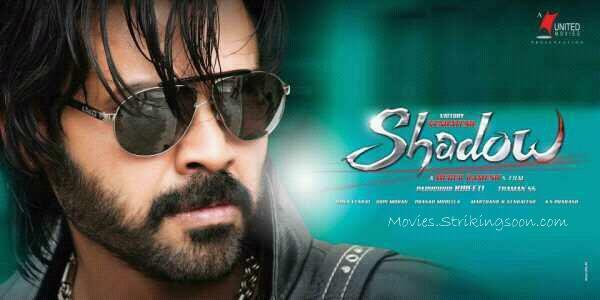 Venkatesh as Shadow with beard look is Okay. He looked very good in other role as Rajaram. His role as Chanti where he acted as memory loss patient is terrible. Meher Ramesh had selected a very routine story on the basis of many Telugu films were made. It was like old wine in a new bottle. The direction is pretty ordinary and screen play offers nothing new. The same movie can be made with modest budget but Meher had spent a fortune. He tries to evoke comedy through MS Narayana as psycho Sreenivas but he couldn’t fully succeed. There are number of prominent actors in the movie for example Suman not at all used to their potential. Tapsee looked extremely pretty but only confined to songs. Her dances in Naughty girl song is very good. Srikanth plays a routine police officer role but he fails to impress as tough cop. Madhurima has got very brief role as Srikanth’s wife and has no scope for performance. MS Narayana stays through out the movie but he couldn’t carry the comic track like he did in his previous movies Dookudu and recent Baadshah. Other comedy actors Jaya Prakash Reddy, Thaguboth Ramesh, Venu, Uttej are wasted. Couples of songs are good (Title song, Naughty girl, Gola gola). Except Tapsee’s dances in Naughy girl other songs have very routine dance steps. Background music is just Ok. Shadow despite having a stylish title and a star hero like Venkatesh, having several top comedians in the movie couldn’t offer any thing new and fails in terms of action and entertainment. We will have to see how audience will embrace this routine formula film. Tapsee’s glamour & Tapsee’s dance in Naughty girl song. Venkatesh looks young as Raghuram.